As far as the iPhone and iPod touch platformers are concerned, games tend to fall into one of two categories: They’re either simplistic titles that provide quick entertainment, or they provide full-fledged gaming experiences that attempt to rival console titles. 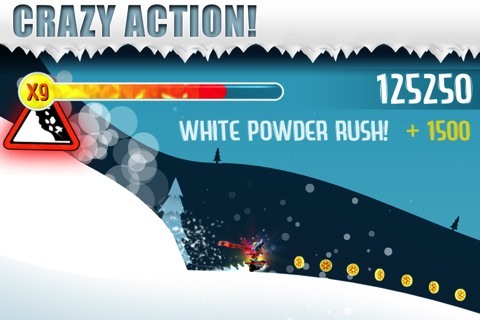 Defiant Development’s app, Ski Safari, definitely falls into the former category. Ski Safari is simple enough. You’re skiing down the side of a mountain, with an avalanche closing in on you. You’ll jump different obstacles and try to avoid the avalanche before it eventually catches up with you. The lure of the title is supposed to be seeing how far you can make it. There’s nothing substantial beyond that. Given that the application has so little in terms of concept, it was only natural to expect that the game’s mechanics would be its saving grace. The less-is-more approach taken in Ski Safari has worked for countless other games. Tiny Wings, Angry Birds and Cut the Rope all feature the same simplistic controls and animated graphics, yet they’re major successes. Unfortunately, the same doesn’t apply to Ski Safari. You tap on the screen to jump, tap and hold to do a flip, and tap rapidly to get back up after a fall. It’s easy to play, but somehow it just manages to be boring. There’s not enough going on to make the mechanics work. Other games that have become popular using simple mechanics did so by offering varying levels or increasing difficulty. Ski Safari does neither, instead challenging you to beat your previous high scores. One of the savings graces of Ski Safari is its atmosphere, which is admittedly well done. The cartoon look is endearing and matches the tone that the title is trying to convey. The music is even catchy, despite being a little hokey. For whatever reason, though, it ran very choppy on my iPhone 4 until I disabled the music. An iPhone app with visuals this simplistic shouldn’t have any trouble operating smoothly, so this is something that needs to be addressed. That lack of attention to detail brings us to the next part of Ski Safari: Value, or at least the lack of it. Outside of the main game, which consists of a single level, there is almost nothing of value in the game. There is no customization or even a settings menu. Once you’ve opened the app and started skiing once, you’ve done everything that there is to do. I was looking forward to playing Ski Safari for this review. It had a favorable user rating, and the landing page sells the concept very well. The lack of any real depth and the abruptness with which the title becomes stale both ruin the value of it, though. It’s only $0.99, but there are a lot of apps available for the same price that will be more enjoyable than Ski Safari. Pass on this one. 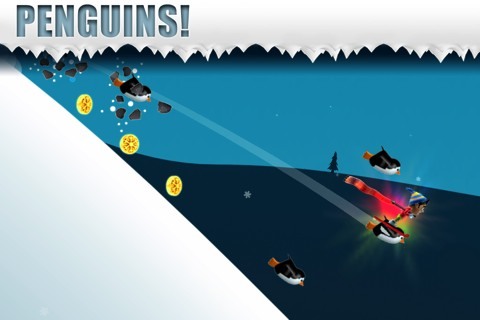 AppSafari review of Ski Safari was written by Joe Seifi on May 23rd, 2012 and categorized under App Store, Arcade, Games, iPad apps, Platformer, Universal. Page viewed 5719 times, 1 so far today. Need help on using these apps? Please read the Help Page. I actually think this game is class, it’s the only thing that I miss from my iPhone since moving to Windows Phone over 2 years ago!